Many people are at a loss as to how the little island paradise Dog Island got its name. It is especially funny since there are no dogs on the island. However, a few believe that the first chart mappers gave it that name because they thought that it resembled a dog. In my opinion it looks like a fish. What do you think? 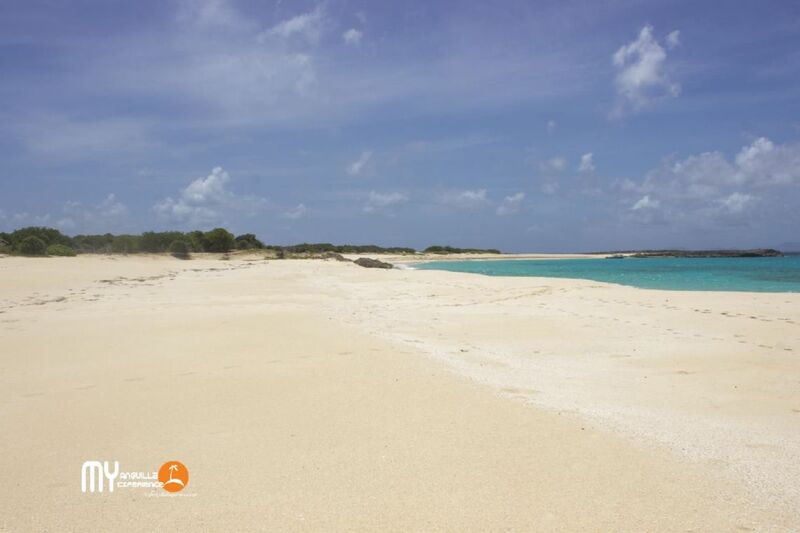 Anyway Dog Island is a privately owned 207 hectares (511 acres) island that is about 10 kilometers (6 miles) northwest of Anguilla. There are three small islets sitting next to the island on the north and west coast. It took us a little under 30 minutes to get there from Road Bay or Sandy Ground. On our way we passed Sandy Island, Seal Island, and the Prickly Pear Cays. 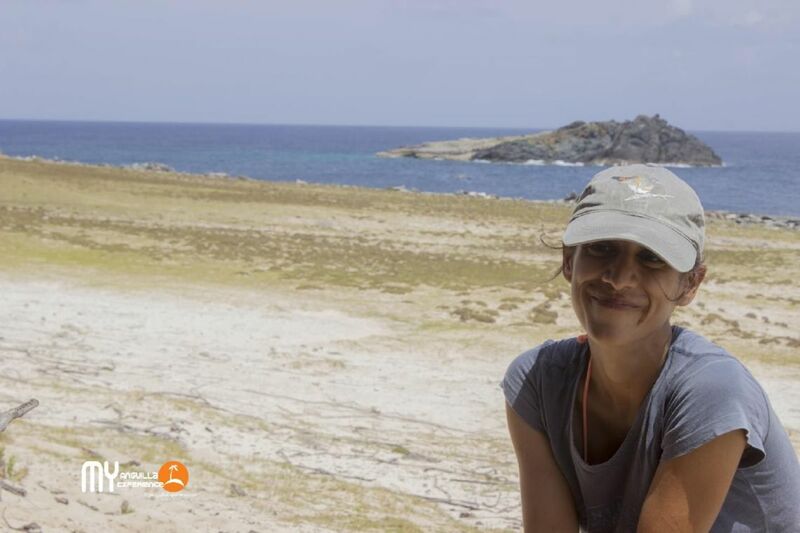 Dog Island is uninhabited by people which makes it perfect for the flora and fauna there. Dog Island is small but its ecology is astonishing. 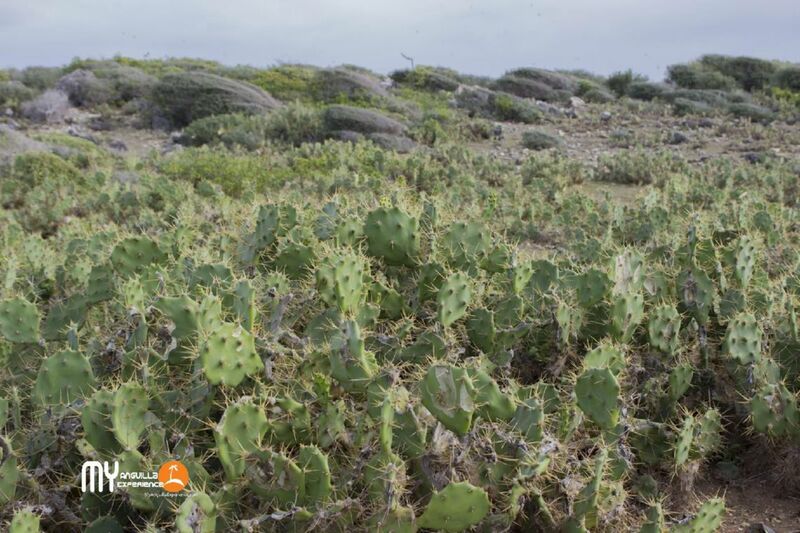 The island is covered in prickly pear plants, cactus, sea grape, and a range of other plants including mangrove and I am sure I saw a loblolly tree. However be wary that there are also groves of the toxic manchineel tree which can cause skin irritation, rash and blisters. To put it in perspective, think in terms of poison ivy. Now what I am about to tell you is what makes Dog Island truly special. 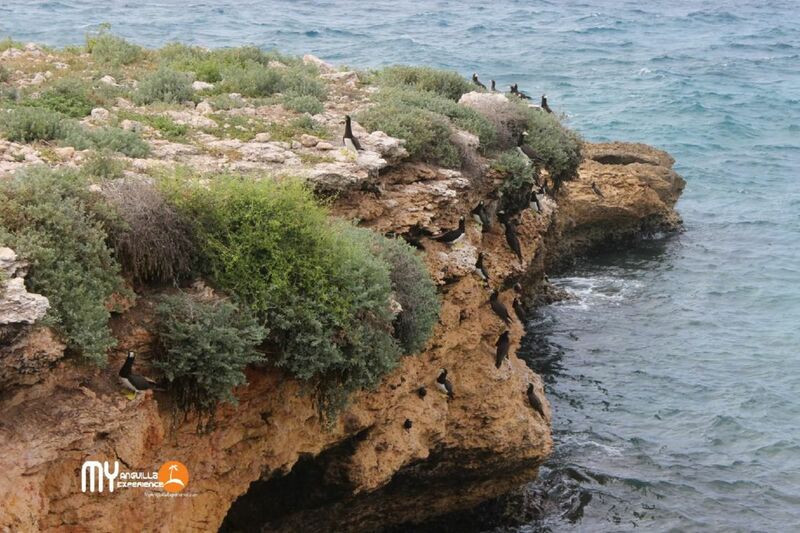 There are over 100, 000 pairs of seabirds on the island. 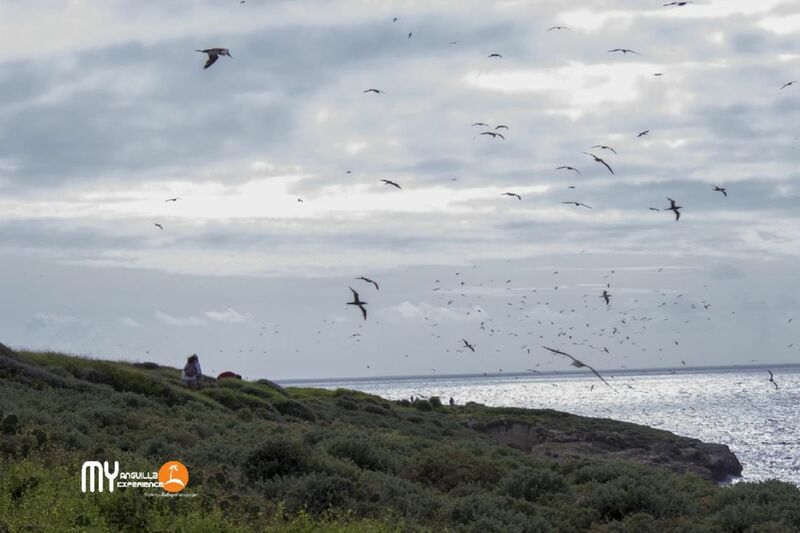 That means the total number of seabirds is over 415,000. That is a really big number. 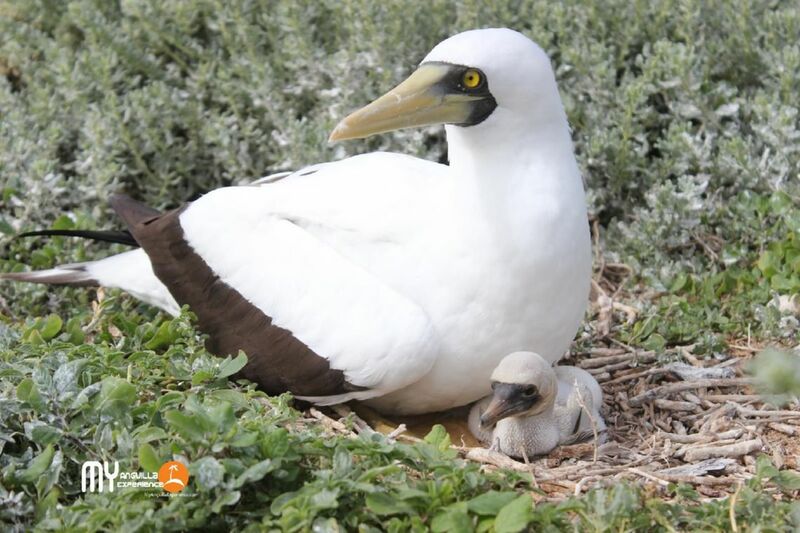 These seabirds comprise 10 different species such as the masked booby, brown booby, laughing gull and the magnificent frigatebird. 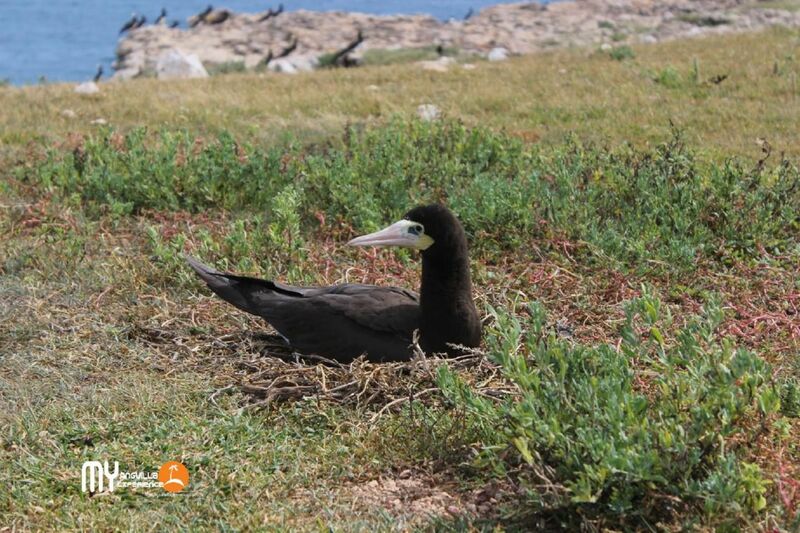 There are a total of 43 bird species on the island including the terrestrial and wetland birds. 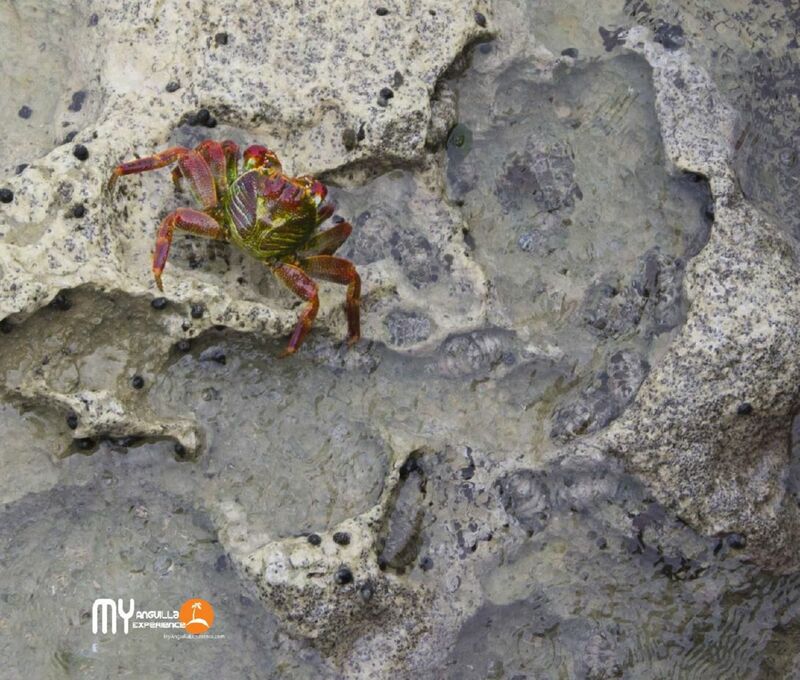 Dog Island also hosts lizards, crabs, insects, and three seriously endangered turtles which are the Green Sea turtle, the Leatherback and the Hawksbill turtle. The coral reefs around Dog Islands are beautiful and magnificent which is why they are legally protected within a 10km2 marine park. 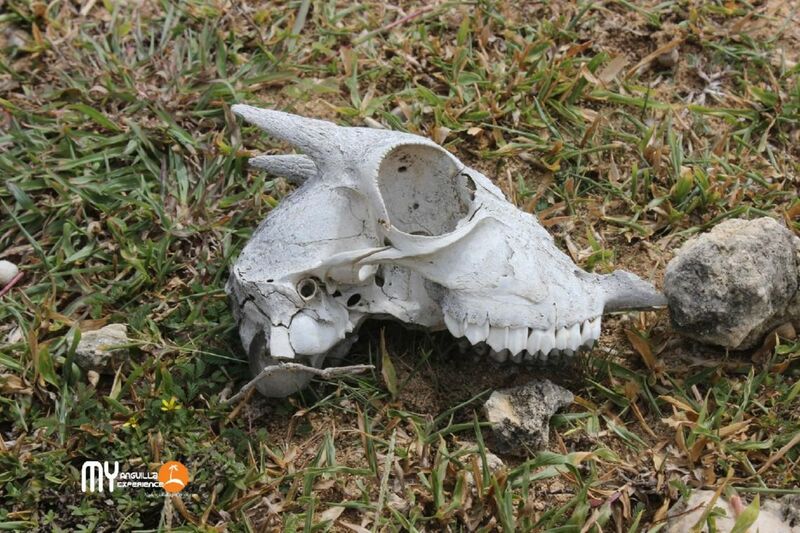 Feral or wild goats and black rats are invasive to the islands which brings us to why we are here. 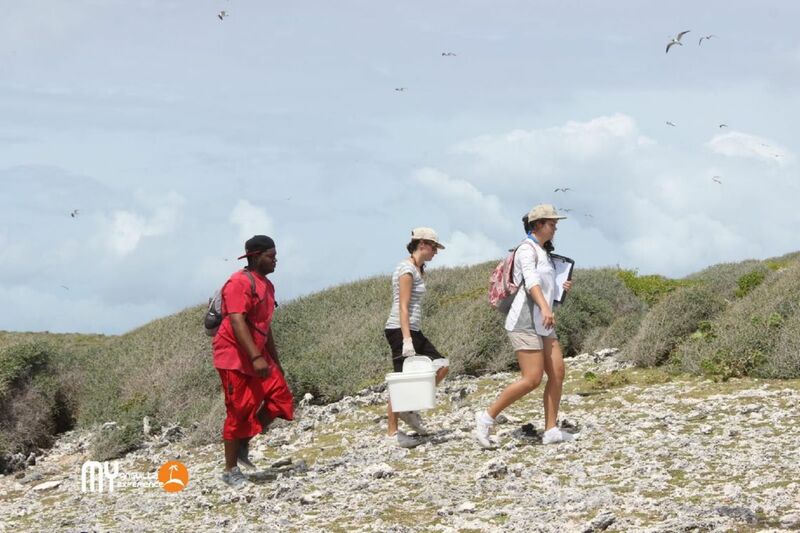 The Anguilla National Trust along with several other organizations set out on a quest in 2011 to eliminate the thousands of black rats which were having a devastating effect on the plant, bird, turtle and lizard populations of the island. 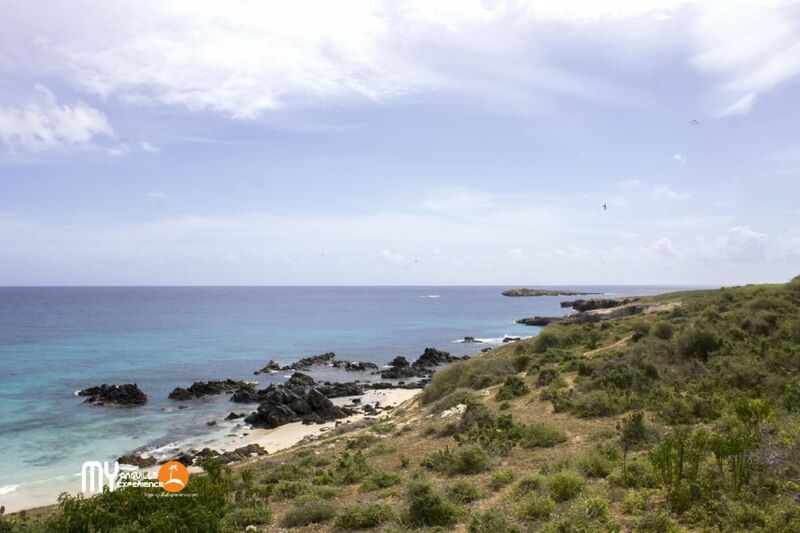 The process was completed in 2012 which makes Dog Island the biggest island in the Caribbean to do so. 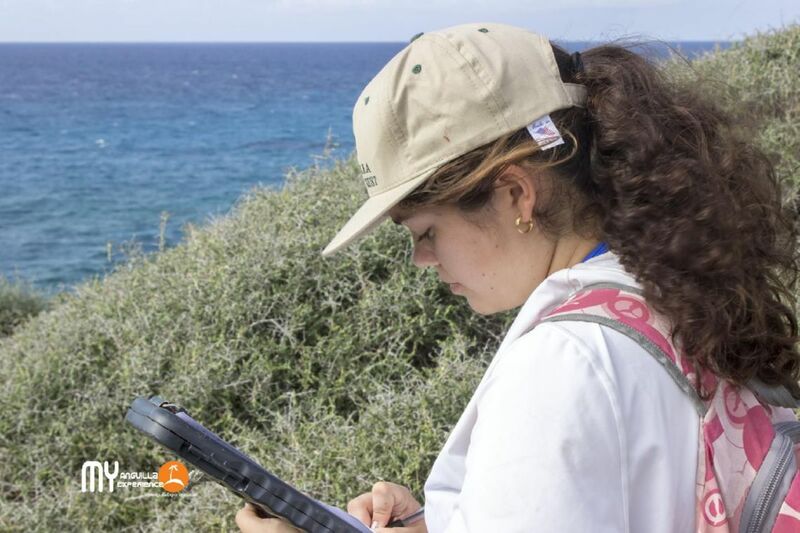 However, to make sure that rats do not have a chance to infect the island again bait stations were placed around the island to encourage any wayward rat to a last feast. The poison does not harm the local wildlife and any bait removed will quickly breakdown into harmless pieces. 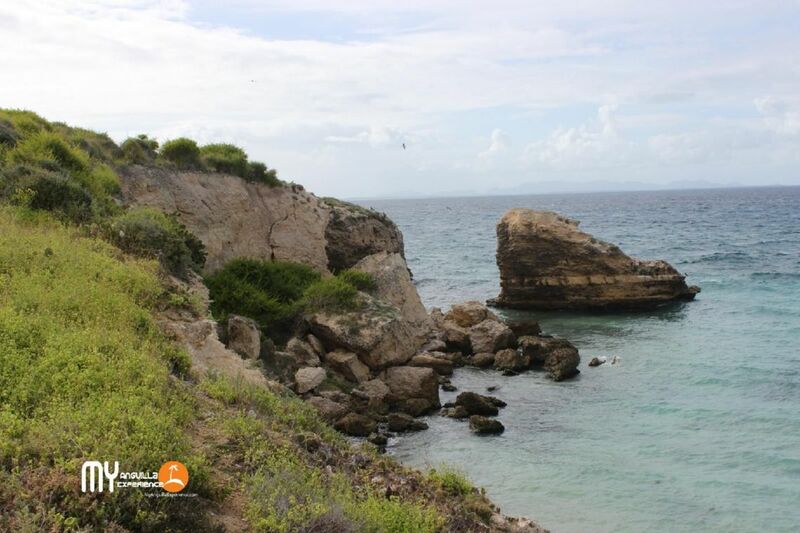 So once in a while the Anguilla National Trust visits the island to monitor and refill the bait stations. This is an island-wide process which is a good thing for me because I got to see most of the island and some birds. We arrived on the island dock at Great Bay. 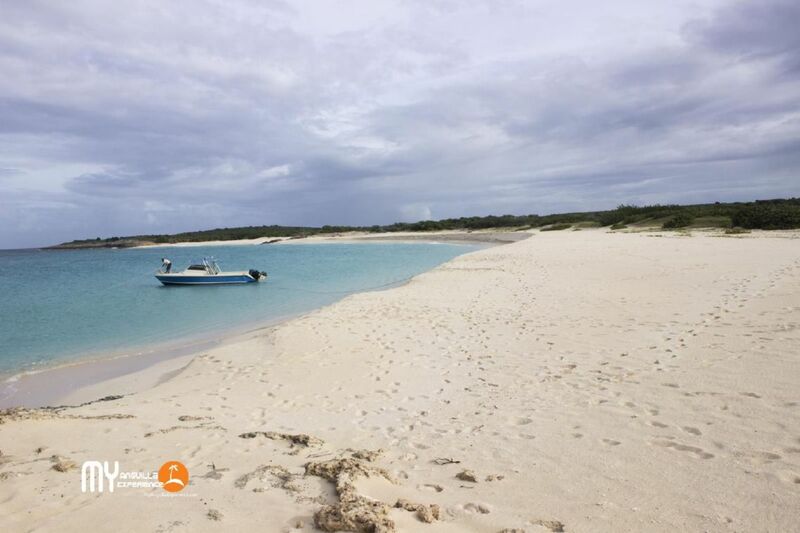 This is a pristine stretch of beach with the softest white sand and such clear water. There is little shade on the island and no fresh water so make sure you cover those items. 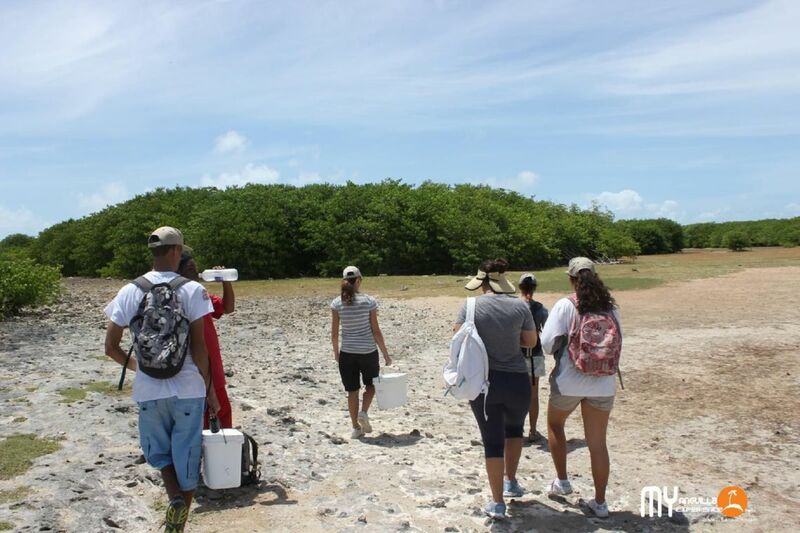 We then split off into 3 teams- 2 to monitor the bait stations and the third to monitor turtle activities. I am with Team Alpha Bait Station (not the official name by the way) and we head off the beach onto the slightly visible path towards the east coast. The first thing you notice is the various landscapes this little island has. Right next to the beach is a stretch of jagged rocks which ends by the entry to a large calm pond. The path continues onto a small beach and then slopes upward through a field of cactus and prickly pear. Ever present are birds singing and flying overhead. “I have never seen so many,” mentioned my friend Isabel in her British accent which I find hilarious (don’t tell her I said that). The path continued upwards until there were no more beaches but cliffs that extended into the water. Whilst dangerous these cliffs did not feel ominous but were rather beautiful to look at. Needless to say I did a lot of looking and my team often went ahead of me. The path continued through bushes and here I got to dance a little. 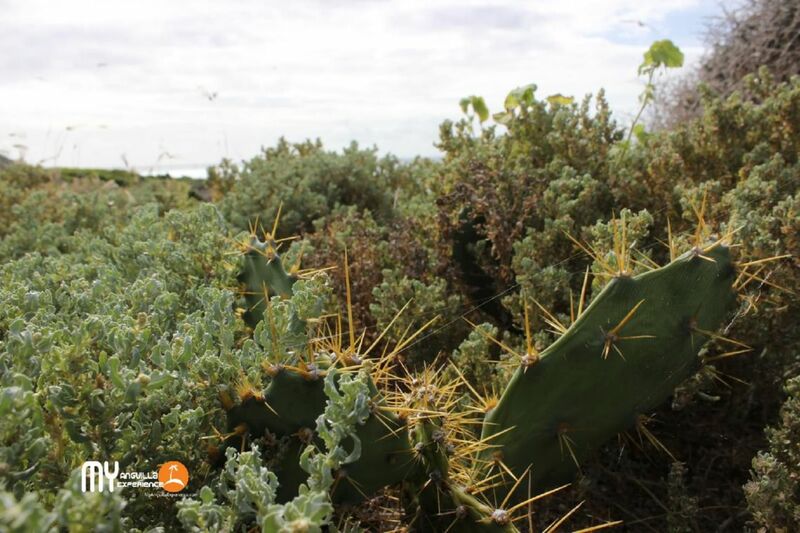 I did not see the prickly pear and it touched me slightly, a sharp painful touch that lingered for at least 15 minutes. I was carefully not to let anything else touch me for the rest of the day. The birds flying overhead were thicker as we passed one of the main nesting areas. Nesting in harmony were brown and mask boobies and they allowed me to get within a few feet without being alarmed. 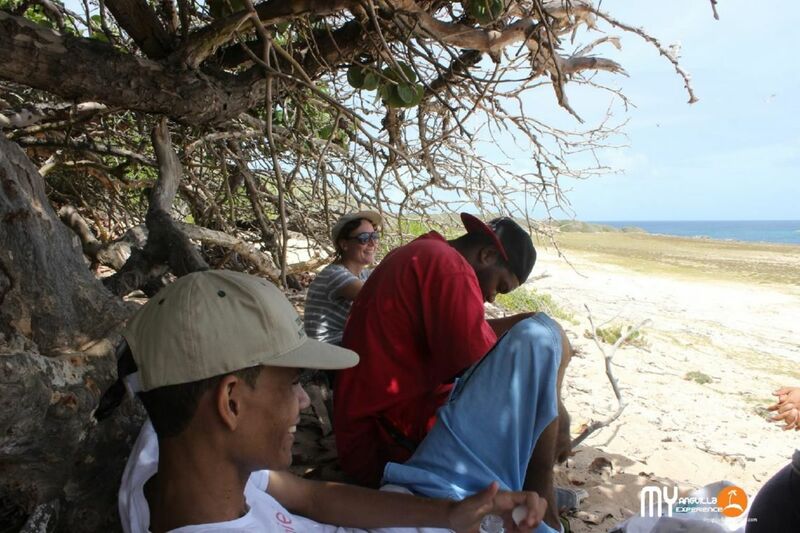 We decided to take a break on another beach after half of our section was completed. It felt good sitting for a while listening to the concert performed by the birds, wind and the waves. I spotted an islet which neither I nor my company knew the name so I called it Puppy Island (in my head I see everyone calling it that). The flocks of birds flying overhead had vanished by now and most of the birds I saw either sat on rocks beside the sea or on the cliff edges. We got a glimpse of some goats but within a second they were gone. It is easy to miss them but they do leave behind quite a bit of evidence. I managed to spot a bright red crab and it stopped running when it realized I had a camera. Just before we arrived at a gorgeous beach on the northern side of the island I saw some rocks sticking out of the water. Their dark black colour associated with volcanic rocks was a vast contrast to the white limestone that surrounds the island. Pretty soon we rejoined the other group and took a short cut through the middle of the island. Here I got to see mangroves and what used to be a landing strip for small planes. The landscape turned into tall shrubs and trees and talking and laughing helped to distract us from the heat. We soon emerged on Great Bay beach. The sand was so soft that I felt like just sinking in. We made our way to the other side and I quickly enjoyed a small lunch and a long swim before we headed back to Anguilla. If you enjoyed this post, you may enjoy our post on A Day at Little Bay or this post about Exploring Windward Point. Thanks for reading. You can follow us at My Anguilla Experience on Facebook, Instagram or Twitter(ShelleciaB) for daily updates and fun information about what we are doing in Anguilla. Nashaine most commonly known as 'Nash' is the technical member of the group. 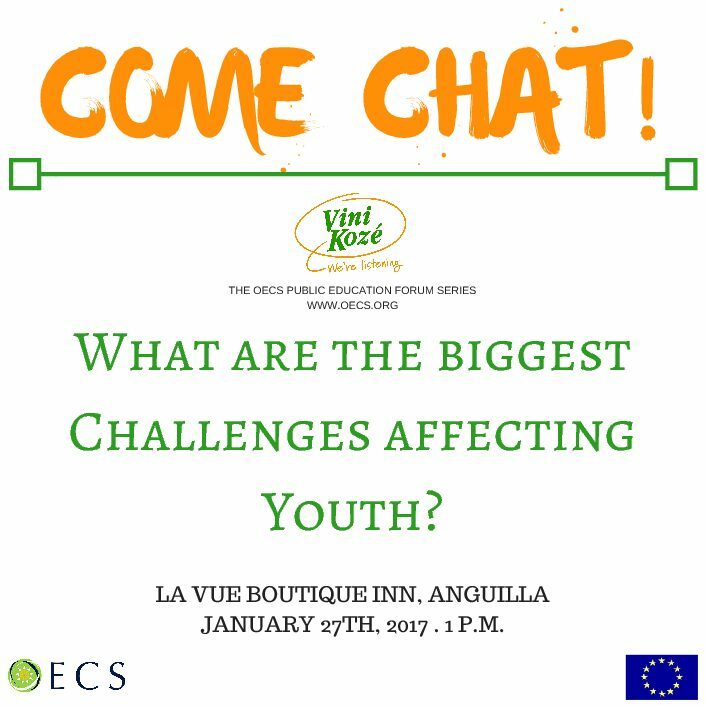 He is a senior computer technician whose savvy computer and design skills have been put to good use with My Anguilla Experience. He is the guy mostly behind the camera and the author of some of our articles. Hi Shellecia, This was a wonderful blog. Thanks alot! I have been to Dog Island once but only to Great Bay and have been very curious to see more of it. I do follow ANT on FB so have known about the successful eradication of the rat. 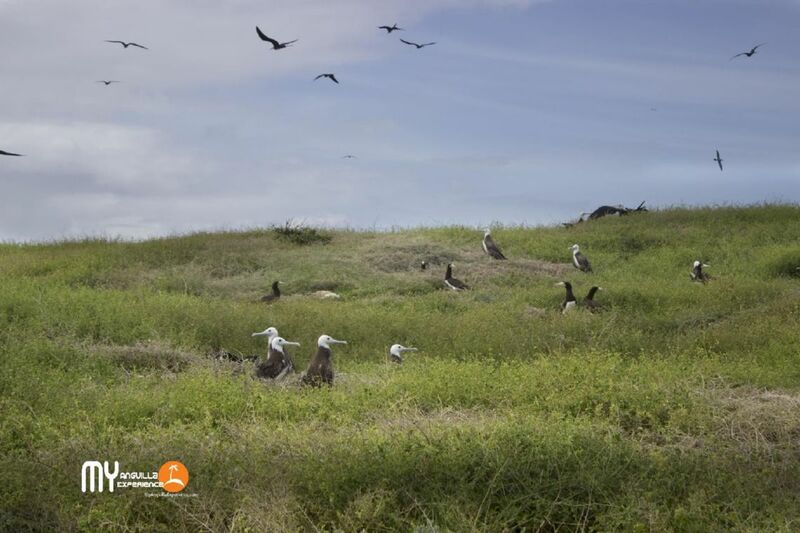 It would be such a treat to seen the frigate birds in mating season. Glad that painful encounter with the Prickly Pear didn’t last too long. You are all courageous for going out there. Hi Brenda. Thank you! 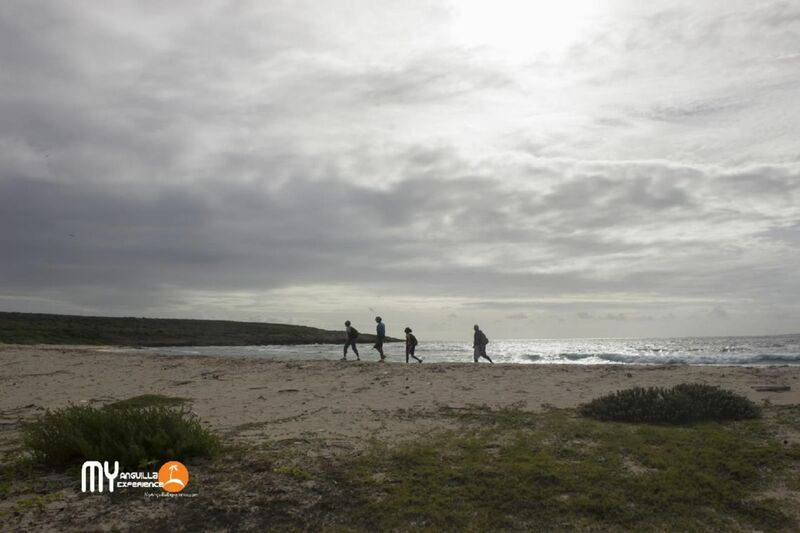 I visited Dog Island last year but this post on Dog Island was written by my husband (Nashaine Johnson) – he is the one who went back to Dog Island last week to help the Anguilla National Trust. Great Bay is beautiful and the birds are amazing. I am sure the Trust would take you along if you are around and if they are visiting during mating season :). Wow, those needles on the prickly pear were huge! I can’t tell you how much I enjoyed your post and pictures. What an adventure. Thanks so much for letting us share it with you. Thanks for taking the time to read our post and for sharing in this experience with us. We are glad that you enjoyed it. Feel free to share with others who may also enjoy reading about Nash’s experience at Dog Island. As always, thanks for your support. Have a great week.